Woohooligan! The Dark Knight Mumbles? I'm back from AnimeFest! This is the 2nd time in a row that I've gotten sick immediately following a convention. D'oh! 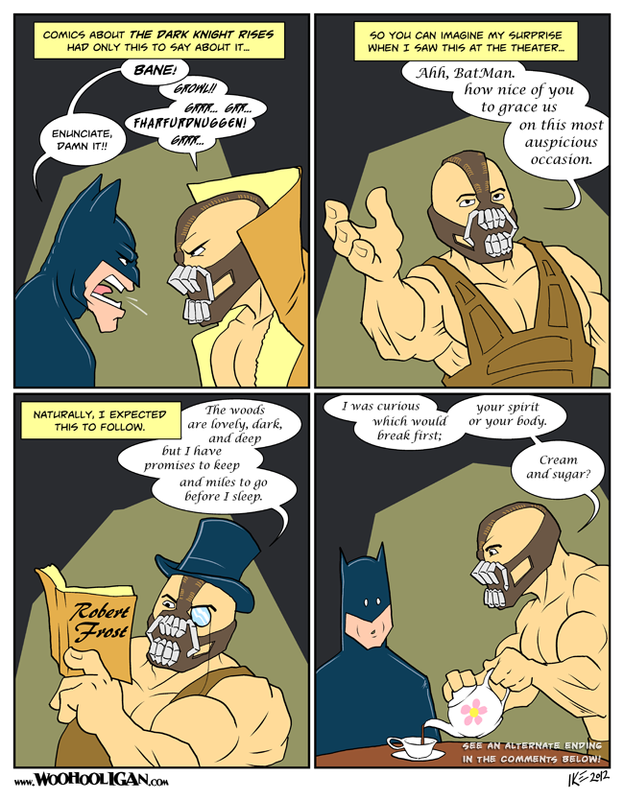 Anyway, do a google search for webcomics about the Dark Knight Rises or search for it on DeviantArt and you'll see this. I saw about 4-5 different comics about the film and all of them said basically that Bane mumbled and growled incomprehensibly through the film... and then I got to the theater and he enunciates better than most of the other characters. He just has a vaguely European accent, which he should, given the backstory he got in the film (fairly different from his backstory in the comics). Overall I think it's a good film, although there were a few things I thought were odd. I may mention that in my next comic. In case you haven't seen it, I will say it's well worth the 3-hour running time.